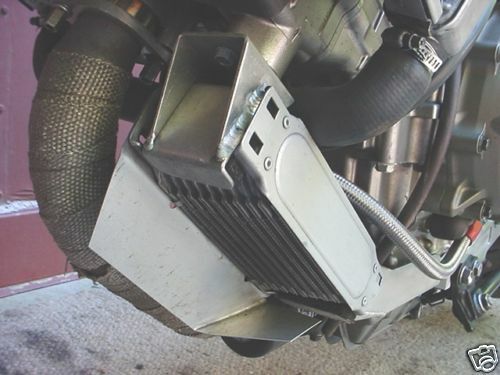 ive seen that an RC51 sp1 4 row oil cooler will bolt right up but needs one of the connections rotated 45 degrees to fit the VTR. how is that piece rotated? is it something i can do or do i need to take it to a radiator shop? ive noticed that she runs slightly hotter due to the pistons and cams so hoping to use the oil as a bit of a cooler. not much you can do to the rads for cooling without spending a ton. a 3rd center mount rad is an option but pricey. also the rad scoops but never see any. it doesnt run hot enough for me to worry. just hotter than id like to see it. based on reports, the larger oil cooler should be sufficient for my needs. Is your fueling ok? I would try to enrich at first. Electric water pump is another solution. Fueling seems to be ballpark. Runs strong. No surging or bogging. I'm going to get it on the dyno at my work in the next day or so. We've been so busy that I haven't had a spare minute to do it. I'll then check the A/F. Seems that lots of people who built motors experienced a little extra heat which only makes sense. Richer mixture deffinatley will keep piston and combustion chambers cooler. Either way I'll throw a bigger oil cooler on there. Elec water pump is a great idea but probably the most expensive. Plus in theory it helps free up some revs from the motor so its in my line up of mods for sure. Help me keep a bit more control of the temp to. Last edited by jscobey; 09-19-2014 at 02:35 AM. EBP is about 100-150 USD, plus some hoses and clamps. And somebody who will connect it, if you don´t have skill. For me it was one of lower budget mods. I am running said cooler and had the inlet rotated by a rad shop. I fabbed a mount out of thin sheet of aluminum and it's been good for 6 years or so. That one looks like a winner Mik! Thanks bud! I'll have to custom fab some mounting tabs on the top. Its a 5 row so it should offer a bit more cooling. Hopefully just enough to get it into a temp range I'm comfortable with. I used the two frame mount holes to support the top of my bracket, and then used the two inside holes of the line fittings (so bolts go through bracket first, then fittings before going into cooler) to support the actual cooler. By placing the cooler so the fittings are at the top, you can use the stock lines with no issues. yea that was sort of how i imagined it. ill be taking the bike to thermal which is a private race track on sunday with they guys from my work. so ill be able to see how things operate under track conditions. its been unusually hot here the past couple days (around 100* F) so honestly its hard to tell if it really is running hotter as i havnt really run a stock engine in that kind of heat before. and its not like it was running that hot so we will see. we finally have a slower day at the shop tomorrow so ill be able to get the bike on the dyno in my spare time. my coworkers gonna teach me how to operate it which should be cool. ill post up the results once i get the print out. excited to see where shes at. honestly ill be happy with anything over 117 to the rear wheel. although i suspect around 120. For me I improved cooling by going to the Chinese rads which are thicker and getting rid of my zx7 8 row oil cooler. The cooler between the rads seemed to block a ton of airflow thru the rads, going back to the small stocker solved the issue. You should at least remove and clean your rads, mine were hideous after lo these many years. I am sure the results would be different at highway speeds but I dont stay there very long around here. I got the TRX rad as well for oil. I mounted mine vertical on the right as you look at the front. Initially using metal strapping. That gave way to fatigue/vibration. I then made an aluminum plate across the two open holes at the front cylinder. Spoot, throw up a pic of how it looks. trailer was pitch black, so did my best. Thats a good idea for where to put it. What lines did you use? I am still wondering about airflow through it with no space behind. Would also worry about that red hot header so close (you could wrap it). At high speeds it should work but dont think so in city riding. Honda left us no room behind the wheel without contact. w/o a lower, you could mount it out further and not hit the tire. as I have it, it's slanted so it misses the edge of the lower. It has a couple inches min. behind it? I bought hose from an auto parts store that said it is pressure rated, gas/oil safe. double hose clamps on all ends. I'd have to look closer to see what it's marked as. I'd love to have those braided line things (AN?) that a couple others have made. Ah yes tuner, that looks right! Heat shield to stop red hot header from pre-heating oil, decent room behind for air flow and the shield doubles as a scoop to guide air through. This is what I will do if I re-attempt the big oil cooler. After my experiments with the cooler between the rads I know that makes it run hotter due to less airflow. This addresses both issues. I'm with Joe on this one. That is a great idea for a larger oil cooler! I have read a lot of your posts and strive to achieve the same. what´s the deal with this sidemount of oil cooler? It looks like much more debris from the road can meet the cooler, and airflow in this place is maybe worse, as it is behind fork and rotating wheel. Yeah mikstr. Wonder if the air box mod has anything to do with slightly cooler running engine. More air more fuel. Although more power=heat. Mikstr, what conditions are you riding in? Meaning are you a highway rider primarily? Also, what temps do you maintain while riding? When you say no over heating problems do you mean like no 240* shut downs? I want to stay far from literal overheating. Even constant hot running is not desireable to me. I saw a drop of 8-10* by going back to the stock oil cooler. Can you post a pic of you setup? I would love to mount the cooler up there but maybe you have a better way to do it. Im interested in you thoughts on the exhaust wrap. I did it on my 250 and had to go up a jet size. Im sure it found a little power with it. After my next 2 track days i intend to pull my exhaust and clean them up. And maybe wrap them.